The spiralizer, and in particular the vegetable spiralizer, has started a trend in the way we prepare, serve, and eat food. A boring cucumber becomes veggie strands that are easy to eat in a salad, zucchini becomes noodles, and potatoes become shoestring fries with just the twist of your hands or the press of a button. Your kids will have so much fun with their food, they will forget they are eating healthy veggies! The best spiralizers can help carb lovers cut back by replacing starchy wheat pasta with noodles made of zucchini, carrots, eggplant, and more. 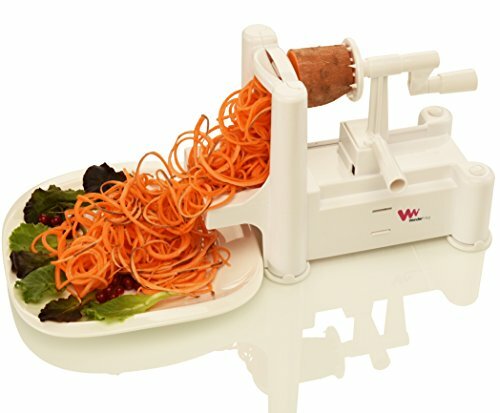 For those who cannot eat wheat, the vegetable spiralizer makes “pasta” dishes fun again by utilizing vegetable noodles instead of wheat noodles. Whether you are trying to lose weight, add more veggies to your diet, avoid wheat, or simply enjoy fun food presentations, a vegetable spiralizer can be a fun tool to add to your gadget collection. 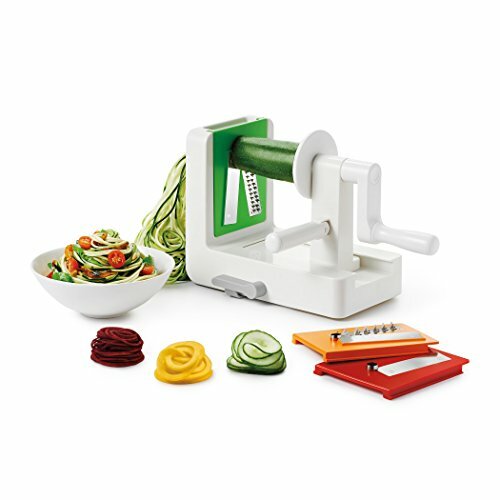 The WonderVeg spiralizer, made of BPA-free plastic and ABS stainless steel, includes three interchangeable blades made of 420 stainless steel for sharp cuts, and a reinforced crank handle that is guaranteed against breakage. You get the Vegetable Shredder blade to create long, spiral, noodle-like strands, the Chipper blade to create long, thick spiral strands, and the Straight Blade to create thin ribbon-like strands. Strong suction feet hold the unit for stability on your table, and an extended work platform catches all of the veggies as you spiralize to prevent a messy work space and aid in quick cleanup. The multiple blades store inside of the unit and all parts are hand wash only. OXO brings to the Good Grips line a 3-blade spiralizer with a suction cup bottom and a side position helper handle to push tough food through the slicer blade as you crank the spiralizer handle. Three interchangeable stainless steel cutting blades are included to create ¼” noodles similar to fettucine, 1/8” noodles similar to spaghetti, or flat ribbon noodles. The three conveniently color-coded blades are stored in an on-board, removable blade box. The unit is BPA free and dishwasher safe. 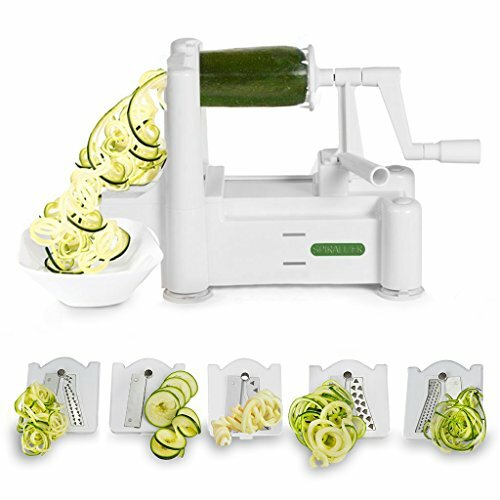 The Original Spiralizer vegetable slicer includes five blades made of 420 high carbon cutlery grade stainless steel with an ultra-reinforced crank handle. 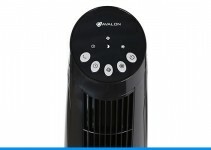 The unit is made of strong, BPA free ABS for strength and durability. The variety of blades include spaghetti, fettuccine, angel hair, curly fry, and ribbon, which are stored in a compartment under the unit. All parts are dishwasher safe on the top rack. 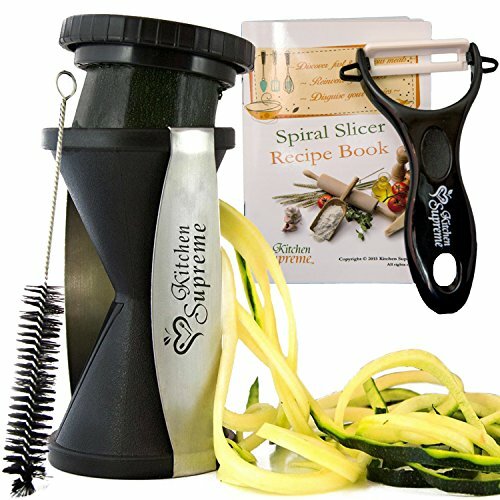 The Kitchen Supreme Spiral Slicer is a simple handheld spiral veggie slicer that produces spiral sliced veggies in either noodles or julienne spirals with nothing but the twisting motion of your hands. It comes complete with a nylon storage bag, a flexible cleaning brush, a recipe book, and a ceramic peeler/flat slicer. Made of BPA-free ABS plastic and heat treated steel, the whole unit is dishwasher safe. Between uses, the Kitchen Supreme fits in a drawer for storage, and comes with a five-year guarantee. It’s always a good sign when a product comes with a long guarantee, something you should expect from the best spiralizer. 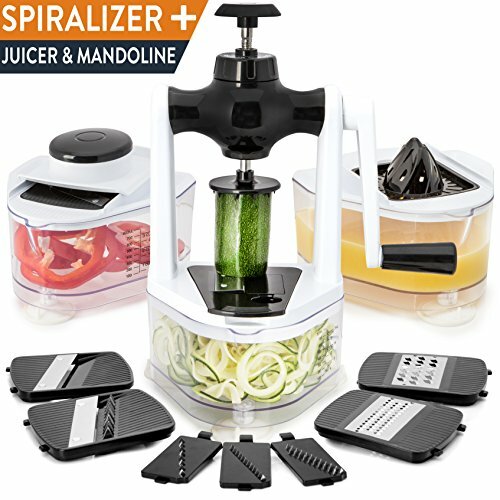 The Mueller spiralizer includes 4 ultra-sharp German 420-grade hardened stainless steel blades for making veggie spirals, ribbons, noodles, and chips, and it also functions as a grater, mandoline, and juicer. 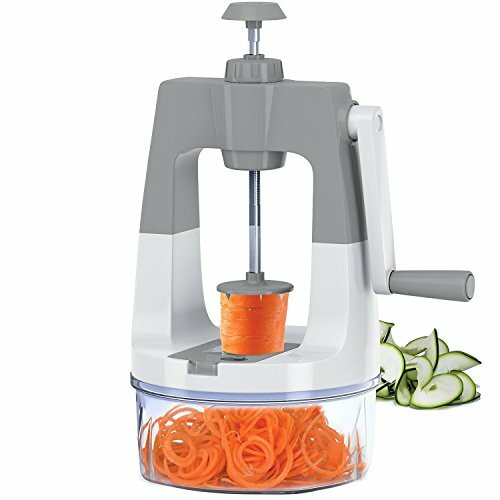 The Mueller may well have the best spiralizer blades. The sturdy crank handle is situated on the top of the unit, allowing the sliced veggies to drop into a 4-cup storage container for a tidy slicing experience and easy cleanup. The slicing blades and attachments are stored on board and the food grade ABS material is dishwasher safe on the top rack only. 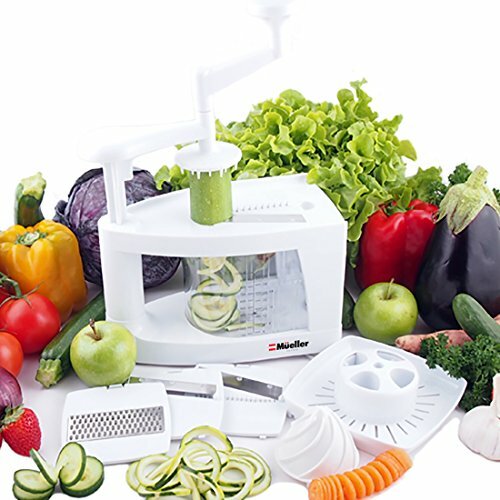 This vegetable slicer has an easily operated crank handle with a “self-pressure” feeder that quickly slices the vegetable without having to exert force as you slice. The three included, interchangeable blades can slice your veggies into thin julienne, thick julienne, or ribbon strands, and deposit them into the attached storage cup that features a rubber strip for stability during use. After use, just toss the parts into the dishwasher and then store the blades inside the unit for your next use. 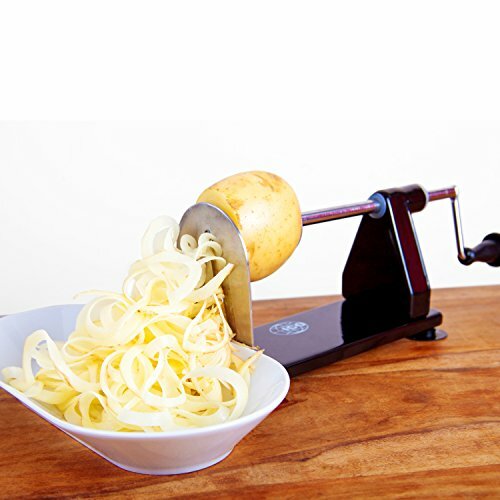 Even the best spiralizer should be simple to operate, and the ScharfPro is exactly that. 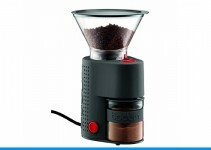 The Veggetti Pro includes three strong interchangeable blades that store in the base of the unit. You will receive a thick spiral blade, a thin spiral blade, and a ribbon blade that easily slice your veggies with a simple crank handle. Strong suction cup feet hold the unit securely to your countertop or work surface to prevent slipping during use. The large size is ideal for bigger vegetables and the whole unit comes apart to toss into the dishwasher. The disassembled unit allows for compact storage in a drawer or cabinet. 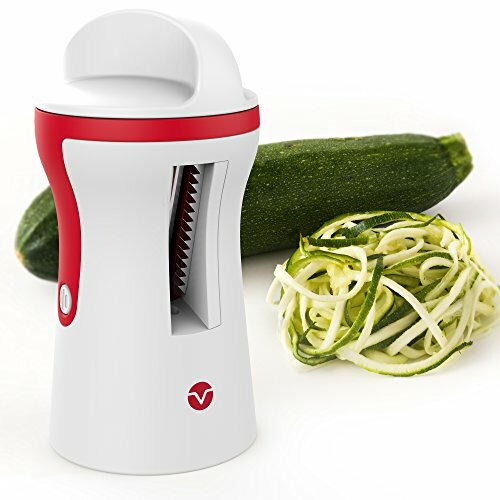 The Vremi is a simple handheld spiralizer that includes a custom flexible cleaning brush and a handheld vegetable peeler for prep work and long, straight, thin slices. Three slicing blade options feature both wide and fine stainless steel cutting blades to produce swirls, sticks, or noodles. The handheld unit is easy to operate by holding both ends of the unit and twisting your hands in opposite directions. This may be the easiest model to operate in our best spiralizer list. Cut food into smaller pieces before cutting and handwash the plastic unit and blades. The Home Hero 9-in-1 Spiralizer offers unique versatility with its nine separate functions. The stainless steel blades allow you to straight slice, grate finely or coarsely, create ribbons and julienne in 4 different thicknesses into the attached 1 quart collection tray, and the juicer attachment will allow you to extract 1 quart of juice. 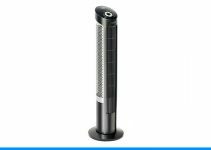 Instead of a crank or hand twist function, this unit features a push down gravity-assisted vertical shaft. 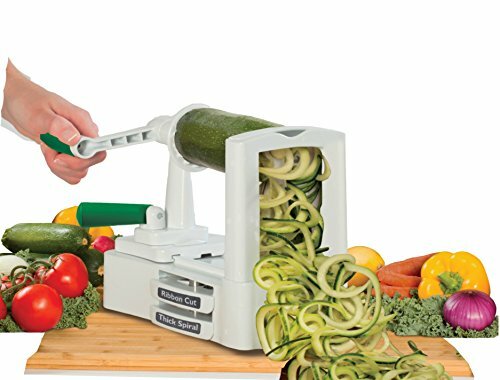 Just push down on the handle and the shaft turns and presses the vegetables through the slicing blade. If you are looking for versatility, then this may be the best spiralizer for you. This compact metal slicer from Impeccable Culinary Objects features two interchangeable blades that spiralize 6-inch pieces of vegetables. The all-metal construction makes a sturdy piece of kitchen equipment that will not easily break. To use, simply insert the vegetable and turn the strong aluminum crank handle. The unit features non-slip suction feet on the base to prevent accidents and provide stability while in use, and the entire thing can go in the dishwasher for easy cleaning. The strong stainless steel blades store in the base of the unit when not in use. Next time you need to make curly fries for a crowd, bring the salad to a potluck dinner, or create a delicious meal for your gluten-intolerant friends, look no further than the vegetable spiralizer to help you get creative in the kitchen. Remember to always read the manufacturer’s instructions before use and rinse the blades right away to prevent stuck on food. Especially in between different vegetables and when it may be a while before the parts (if dishwasher safe) make it into the dishwasher. No matter which from our best spiralizer guide you choose, enjoy your new way of preparing vegetable dishes!